Every website has a "long neck"--a small set of tasks that are very important to your customers. In this book, Web content expert Gerry McGovern offers tried and tested tips to make your website the commercial asset it really should be. The Stranger's Long Neck is a practical guide for any manager wishing to improve their organisation's online performance. Web content specialist, Gerry McGovern, explains that all websites have a small set of tasks, or "long necks," that are important to its customers and that must be easy to complete or customers will go elsewhere. 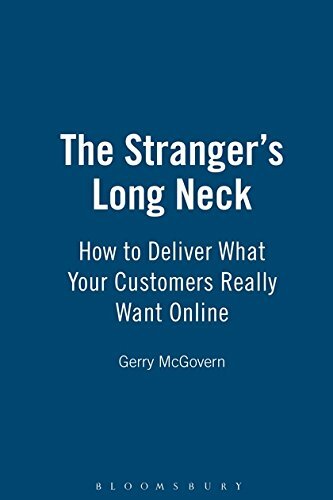 The Stranger's Long Neck shows how to tune in effectively to what your customers want--and then deliver it with aplomb. Understanding customer needs can be a difficult task when customers are ‘strangers', in that he or she is always "on the outside," particularly so in an online environment. Using case studies including Tetra Pak, Microsoft and the NHS, and illustrated with web shots throughout, The Stranger's Long Neckshows how organisations can use the ‘long neck' theory to create and manage efficient and user-friendly websites.